David Burke (Ed Begley) is a former police detective who was forced to leave his job who has a plan to rob a bank, but needs some help to pull it off. 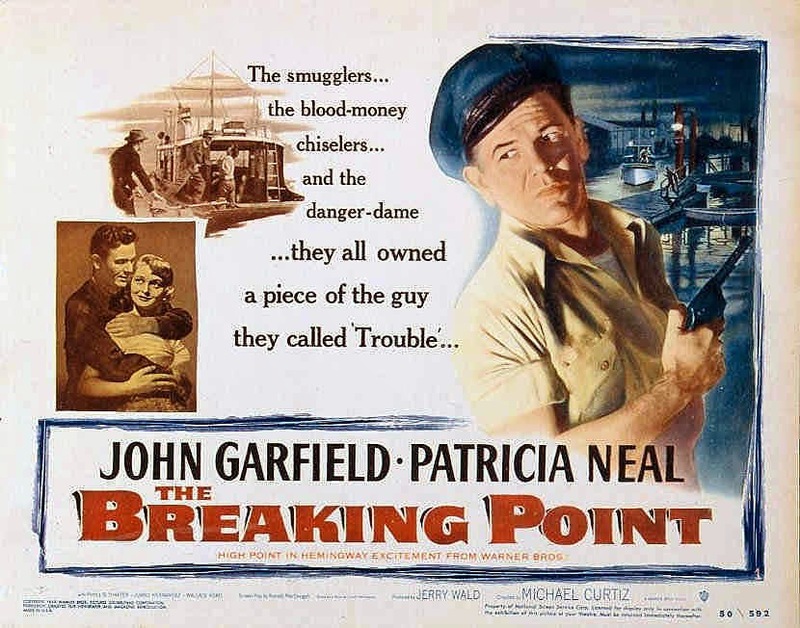 First is Earl Slater (Robert Ryan), a real tough guy and former criminal, and then there’s Johnny Ingram (Harry Belafonte), a nightclub performer with a fondness for gambling. Earl isn’t interested in it at first, but David has promised him $50,000 for his assistance and Earl could really use the extra money because he feels guilty for letting his girlfriend Lorry (Shelley Winters) support him. Johnny doesn’t want to be involved at first, either, but he has a fondness for gambling and owes some money to a gangster who has threatened to harm his ex-wife and daughter if he doesn’t get his money. Both Earl and Johnny reluctant agree to help David with the heist, but there’s one major problem — Johnny is a black man and Earl is deeply racist. Earl wants to back out when he finds out who his partner in crime will be, but ultimately can’t stand being a kept man. David has planned the heist out in detail, but Earl’s intolerance of Johnny puts the heist in jeopardy. When the time comes to rob the bank, they start to carry out their plan, but it all goes awry because Earl refuses to trust Johnny. 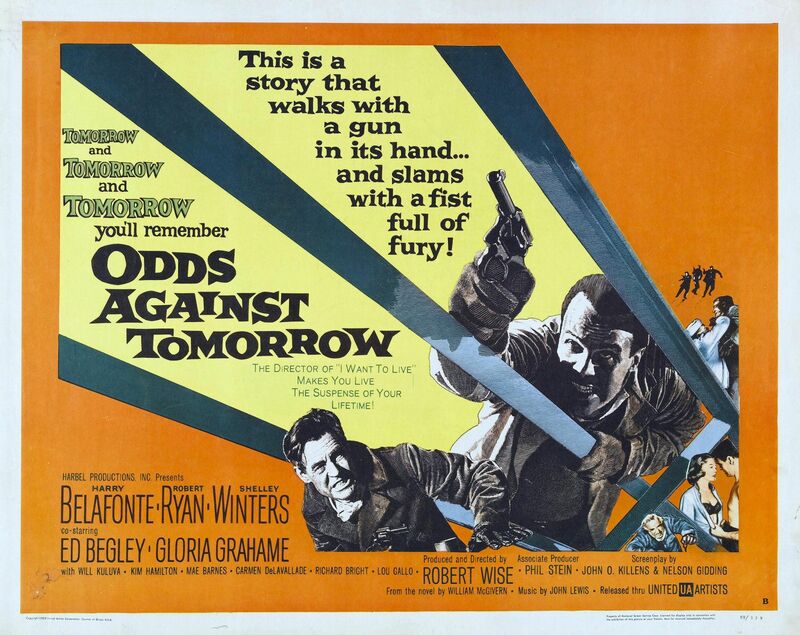 Three words for Odds Against Tomorrow: first-rate noir! It’s an incredibly gritty movie with a gripping story, a great score, excellent performances, and fascinating characters. And when I say it’s gritty, I mean this is a movie that absolutely revels in grit and grime. It’s a movie that didn’t hit any wrong notes with me and that almost makes it hard for me to write about, because there’s nothing negative for me to say; I liked it all. This was a B-picture, so it’s a an excellent example of how you don’t need a huge budget to make a real knock-out of a movie. Posted in 1950s and tagged Ed Begley, Harry Belafonte, Robert Ryan, Shelley Winters on September 1, 2015 by Angela. Barbara Beaurevel (Ava Gardner) is the granddaughter of a rather notorious woman who now lives in New Orleans with her uptight, socially-conscious aunt Eula (Lucile Watson) and cousin Paul (Melvyn Douglas), who is romantically attracted to Barbara. Barbara’s notorious grandmother is something Eula tries her hardest to keep secret. Barbara is in love with Mark Lucas (Robert Mitchum), who is about to take a trip to Africa to do some research, and Mark wants Barbara to join him so they can be married on the boat. She desperately wants to join him, but when Paul realizes what she’s doing, he talks her out of it. Barbara writes a letter to Mark telling him that she’ll wait for him, but Paul makes sure he doesn’t get it and Eula wants her to marry the wealthy Clay Duchesne (Gordon Olvier) instead, but she waits. But since Mark never gets her letter, he marries a woman named Corinne (Janis Carter) instead. Meanwhile, a lawyer has been coming by Eula’s home, looking for Barbara to tell her about an inheritance. Since being honest would mean admitting to being related to Barbara’s grandmother, Eula tries to send him away. But when Barbara finally meets with him, it turns out she’s due to get a million dollar inheritance. Thanks to her inheritance, Barbara has the money to make herself the belle of New Orleans society and she starts by throwing a large party and inviting all of the most important people in town, including Mark and Corinne. Corinne is a bit of a social climber so she loves the idea of going to a society party and Mark doesn’t want to go at first, but when Paul insults him, he decides to go out of spite. She’s hoping to convince Mark to divorce Corinne, but when she notices an attraction between Corinne and Paul, she comes up with another scheme to get them apart. 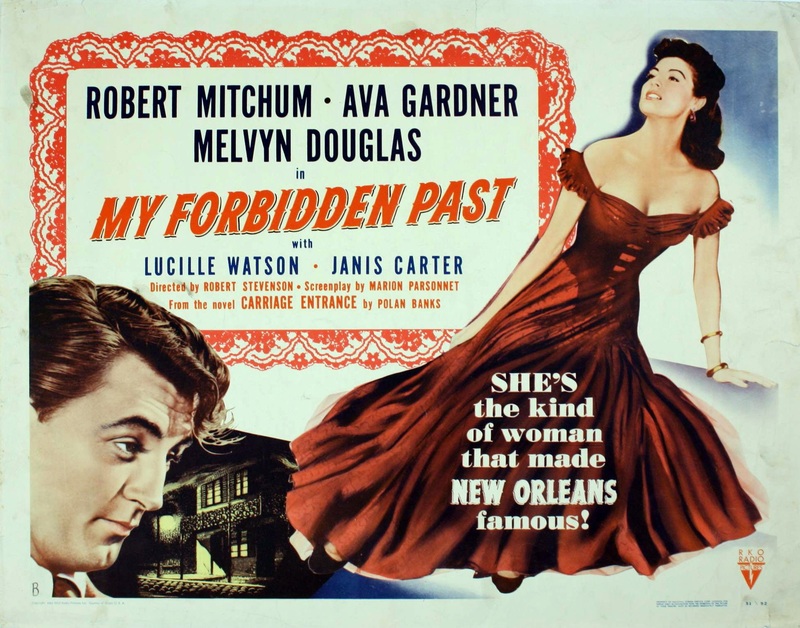 My Forbidden Past was a completely and totally mediocre movie. It’s far from being one of the worst movies ever, but despite the good cast, there’s nothing interesting about it, either. It clearly wasn’t meant to be a prestige picture, although the first-rate cast might make you think otherwise, but there are so many other B-movies that are so much more interesting. 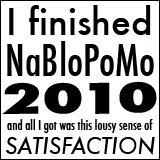 The story could have potentially been more interesting, but it just didn’t pan out that way. The movie was too rushed for that. I kinda wish I had picked any other movie from today’s lineup to write about; any of them would have had to have been more interesting than this. Although I do love it’s ridiculously salacious sounding tagline of, “She’s the kind of woman that made New Orleans famous!” It makes it sound so much more scandalous than it really is. Ty Ty Walden (Robert Ryan) owns a cotton farm that once belonged to his grandfather. Or, at least, it used to be a cotton farm. Ty Ty believes his grandfather buried gold on the farm and has spent the last 15 years digging holes all over the property with two of his sons, Buck (Jack Lord) and Shaw (Vic Morrow). They haven’t found any gold, but Ty Ty refuses to stop trying, even though with all his digging, they haven’t been able to grow anything on the farm in years. The one place he hasn’t tried digging yet is an acre of land he calls God’s little acre, a plot of land Ty Ty has promised that anything that grows — or is found there — goes to the church. But he’s pretty willing to change his mind about where exactly God’s little acre ought to be if he suspects the gold might be buried there. The quest for gold has taken a major toll on the family. The family is completely destitute and many of his family members are fed up with his ridiculous quest for gold. 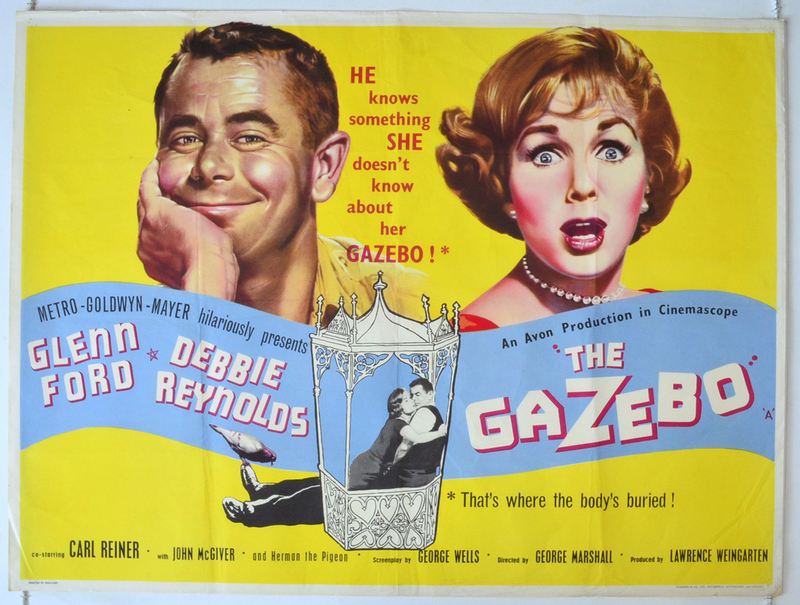 Meanwhile, Buck is upset that his wife Griselda (Tina Louise) is still in love with her former lover Will (Aldo Ray), but Will is married to Buck’s sister Rosamund (Helen Westcott). Will used to work in a cotton mill, but ever since the mill closed down, he refuses to do any other kind of work and spends much of his time getting drunk. The only one who has anything promising happening is Ty Ty’s daughter Darlin’ Jill (Fay Spain), who has just been proposed to by Pluto Swint (Buddy Hackett), who is running for Sheriff, although she wants to wait and see the results of the election before she says yes. Ty Ty is so desperate to find the gold, he and Uncle Felix (Rex Ingram) kidnap a Dave Dawson (Michael Landon), a local albino, because they’ve heard they have magical powers for divining gold. When Dave leads them to an area close to the house, they get to work digging yet another hole. But when it becomes clear there’s no gold to be found there, Uncle Felix suggests that Ty Ty either asks his other son Jim Leslie (Lance Fuller) for money or give it up and go back to farming so the family can have some money again. Meanwhile, Will, in a drunken stupor, tries to re-open the cotton mill, with tragic results. 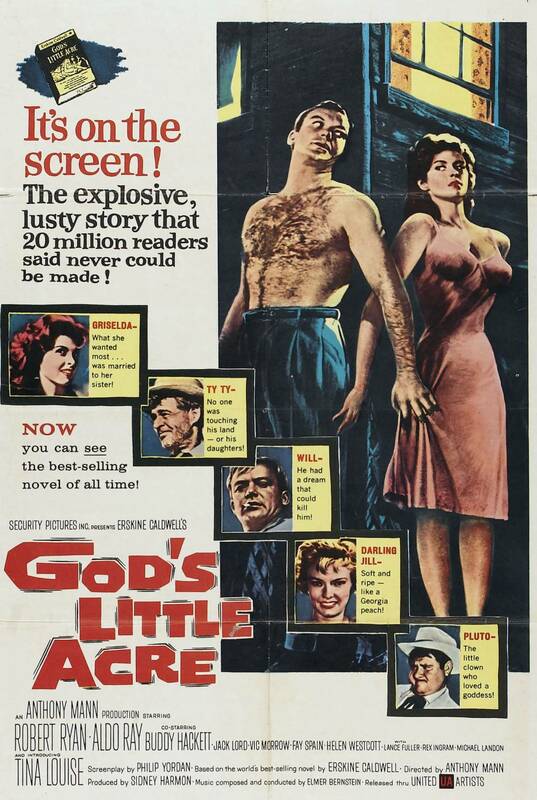 I’ve been wanting to see God’s Little Acre for a while now and I was hoping it would be the sort of movie I’d love, but it somehow missed the mark with me. It’s not a bad movie, but I can’t help but feel like something must have been lost in the transition from novel to film here. I’ve never read the novel, but it’s just a hunch I have that the book did the story more justice. There’s a lot of interesting things going on, but somehow, they just didn’t seem to gel right with me. I didn’t hate anything about it, but I didn’t love anything about it, either; it just fell smack in the middle of the road for me. It pretty much just made me want to check out the original book, instead. Posted in 1950s, Blogging Under the Stars, Dramas and tagged Aldo Ray, Buddy Hackett, Fay Spain, Helen Westcott, Jack Lord, Lance Fuller, Michael Landon, Rex Ingram, Robert Ryan, Tina Louise, Vic Morrow on August 12, 2015 by Angela. Ruth’s dreams of stage stardom only get bigger when she gets a response to a fan letter from her idol Hazel Dawn inviting her to come meet her backstage after a performance. Hazel knows about Ruth’s desire to be an actress and later sends Ruth a message saying she’s arranged for a Ruth to meet an important director. Eventually, she has to tell her father about her dreams of stardom when he insists on filling out her application to go to school to become a gym teacher. He has her doubts about whether or not she could make it as an actress, but is surprisingly supportive. However, he really wants her to finish school first and absolutely doesn’t want her to go to her interview with the director. Part of the reason Clinton isn’t so willing to give Ruth his unrelenting support is because financial instability is a big concern for him. Not only for her, but because he’s worried about his own job and doesn’t think he’d be able to support her studying to become an actress. When he gets some news that assures him his job is secure, he promises to send her to acting school. Ruth is thrilled, but when something goes wrong at the last minute and Clinton loses his job, she refuses to let it hold her back. And sure enough, Clinton finds a way to help. The Actress is based on actress Ruth Gordon’s own experiences as a teenager. 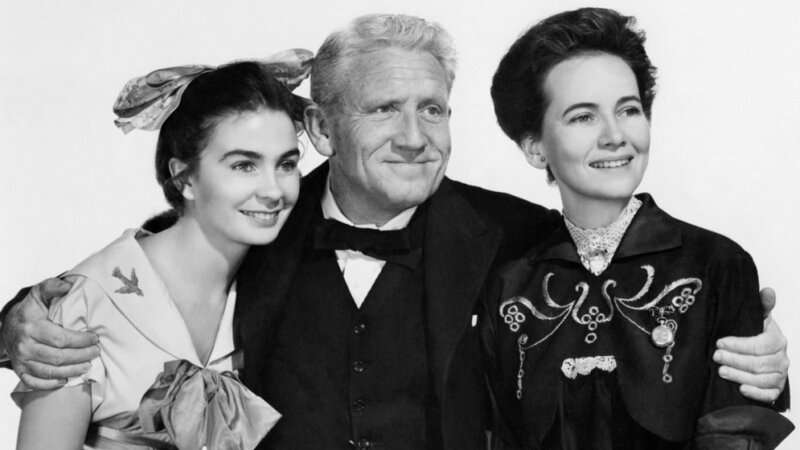 Although it’s a story about Ruth, Spencer Tracy is the one who gets the richest role in the movie. Spencer Tracy was an expert at playing characters who could seem gruff and stern, but still had a soft side to them, and this is very much on display here. This was very much intended to be a tribute to Ruth Gordon’s father and Spencer certainly did him justice. 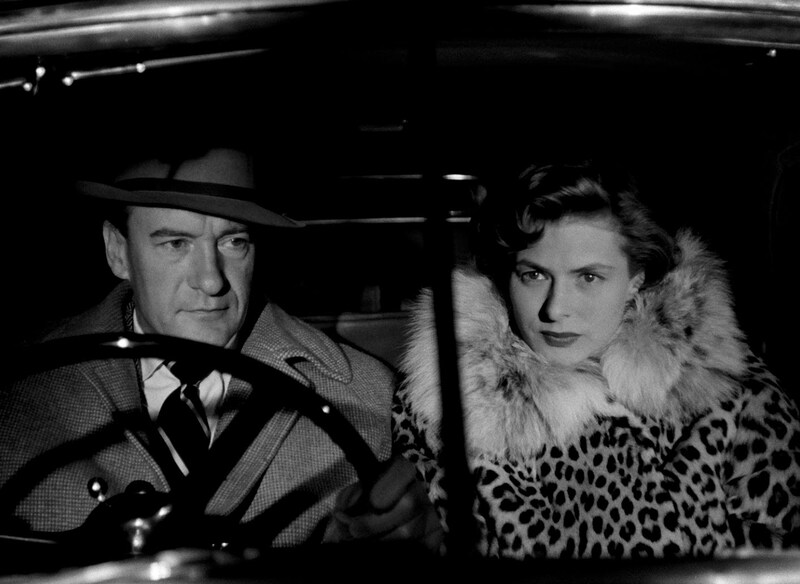 On the whole, it’s a very pleasant movie with just the right amount of sentiment. It may not be anything truly spectacular, but it’s still likable enough that I’d give it another watch if there wasn’t much else on television. The Actress is also noteworthy for being the film debut of Anthony Perkins. Posted in 1950s, Blogging Under the Stars and tagged Anthony Perkins, Jean Simmons, Ruth Gordon, Spencer Tracy, Teresa Wright on August 5, 2015 by Angela.